What are some jobs that can change the world? Hmm? Of course the president, a famous athlete, a singer, a computer programmer, things like that. Well, how about a weekly movie creator who’s a Christian, a conservative, has an instructor’s license in Krav Maga and doesn’t shrink back from an altercation? No, you think. That couldn’t change the world. Actually it could. How do I know that? Because that’s the very kind of guy that I met with this week; Molotov Mitchell. Before I start this column, though, here’s a warning note to my readers–If you think that Christians should be peaceful as doves, not raising a fist to anyone who opposes them, then stop reading right here. Because this article is all about how Christians should be warriors, fighting their way through the world if any evil dares get in their way. Yeah, I know what you’re probably thinking: “What’s with this kid, talking like that? The Bible doesn’t say that kind of stuff. He’s just been playing too much Modern Warfare, that’s all.” Well, that’s the kind of thinking that goes on in Molotov’s head every day (as you can see from the ‘Zealot’ tattoo on his arm in the picture). Want to know the story? Then keep reading. Dad and I left for Raleigh, North Carolina (where Mr. Mitchell lives) at eight Thursday morning, so we could get there around four-ish. On the way there, we admired the incredible scenery that was all around us. Almost the entire road ran through the mountains, and there was a fog resting on all of the peaks. The sky was cloudy, so there wasn’t any piercing sunshine getting in our eyes. There was absolutely no civilization within sight of the road; it was just us and nature. It rained a little, but it was merely a sprinkle that kept the car from growing too hot. We had about five hours to absorb it all, and then we hit the first few houses and towns along the road. From then on, the towns became cities, the stores became malls, and the buildings went from two stories to ten. Finally, we arrived in Raleigh. After checking into our hotel and dropping off our bags, we went to hook up with Molotov. He had mentioned a restaurant in town, so that’s where we headed. We arrived a few minutes early, so we just sat around until Molotov showed up. When he entered, we were treated to a surprise; he had invited to come along with him a woman who works with him at Illuminati Pictures: DJ Dolce. Dad and I introduced ourselves, and together we grabbed a place to sit. After ordering, before they brought our food, we chatted a bit and got to know each other a little better. Molotov is, as I’ve already stated, the president and founder of Illuminati Pictures, a company that makes movies, documentaries, commercials, and does a few black bag jobs on the side. The company also turns out two different weekly films, which are basically funny, informative, three-minute movies from a conservative’s standpoint that document Barack Obama’s reign of office during his term: one called “For The Record,” starring Molotov himself, and “News, News,” presented by the aforementioned DJ Dolce, or DJ for short. After around ten minutes of chitchat, our food came, and we became immersed in the delicacies awaiting us. We spent half an hour eating and wrapping up our discussions, and when we were done, Dad left. The first thing that Molotov had planned was a Krav Maga class that he had to attend. 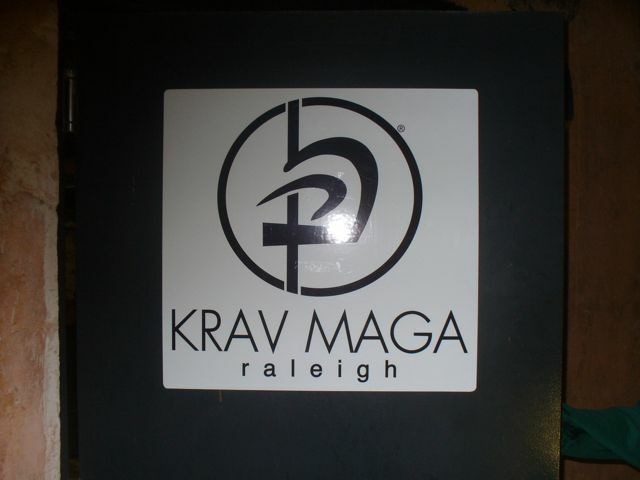 In case you’re not familiar with Krav, it was created by a Jew living in Czechoslovakia during WWII. As an Israeli civilian, he and his neighborhood would be terrorized by Nazi gangs ravaging the cities. He wanted a fighting system that was best for a down-and-dirty street fight, in which there are no rules. 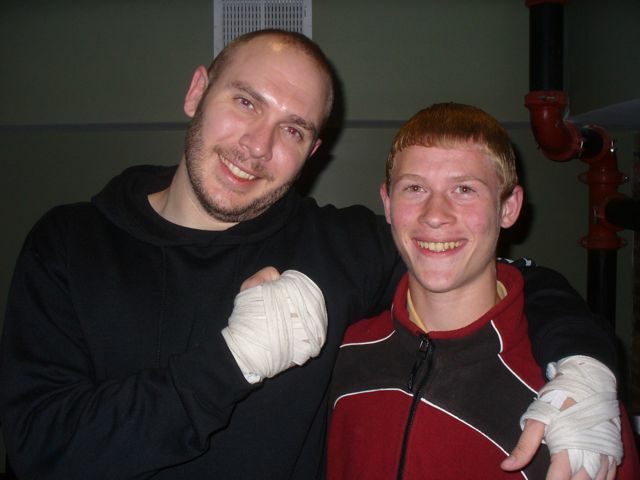 He already had a vast knowledge of several other martial arts and boxing, so he combined them and got Krav Maga. Today, this fighting system is taught to almost every single special forces branch in armies worldwide (i.e. 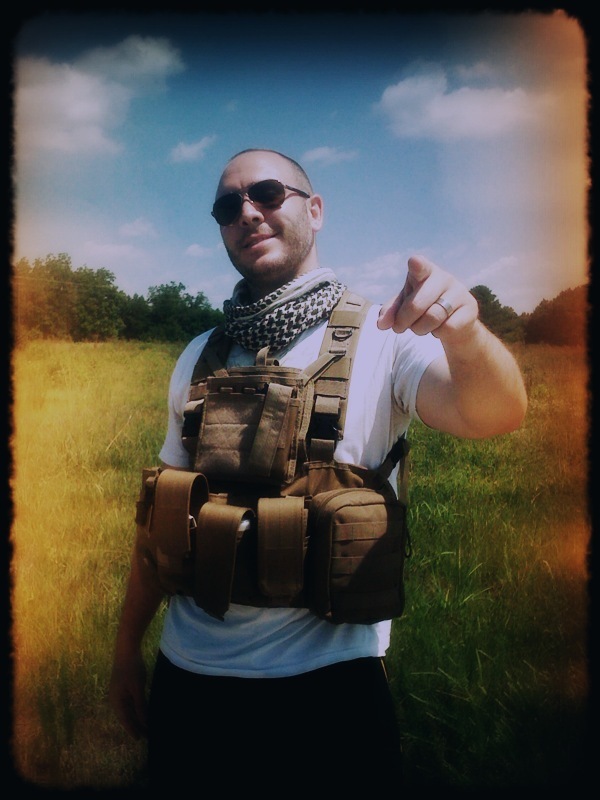 Navy Seals, Green Beret, and guys like that). There are five levels in Krav, and Molotov is a level three, as is DJ. They were in a class with two other people, also level threes, and were instructed by a guy named Ken, a level five. Ken has been involved in fighting systems and martial arts since he was six, and he is lightning fast with all of his moves. He’s a good teacher as well, and his four budding pupils have learned well from him. They started off by warming up, and then shadow boxed for a few minutes. After that, the class learned a few kick-and-punch combos. One of them was a 1-2 Kick, 2-3 Round Kick. What that means is left cross right cross kick, right cross left hook roundhouse. If you do it fluidly, the kicks and punches run together and keep your inertia moving positively. They practiced for an hour, working on that combination, and then dismissed. Molotov had about an hour before he had to teach a class himself, so he and I used up the time at a coffee shop, talking. First, he told me a little about his life. His parents divorced when he was five, and he left the house at 17. He did a little experiment for a year, where he lived and slept on the streets with the homeless people. At the end of the year, he was convinced that there had to be a god, because he saw the world around him in a new way. Once he had gotten that far, his next step was to decide which god it was. He read the Qur’an, the Tipitaka, the Vedas, the Book of Mormon, and got very close to joining one of those religion. But then he read the Bible including the verse in John 14:6 which says, “No man comes to the Father, but by me” and thought “Wow; this guy is either the cockiest prophet in the history of the world, or…he’s right and pretty much everybody’s toast.” So Molotov narrowed it down to two options: either Jesus was lying, or he was telling the truth. The whole ‘maybe he’s crazy’ job isn’t a choice. So then he went around to the various leaders of religions in his area and asked them, “Would Jesus ever lie?” Now Jesus is a pretty special figure to most people. In Islam, he’s even more perfect than Muhammed the Prophet. So predictably, all of the religious men replied in a shocked voice, “Of course not! How could you even suggest that?” And then Molotov took the Bible, reversed it so they could see it, and said, “Then explain this verse.” They immediately made some excuse about talking to their cleric or getting back to him later about it. They couldn’t answer. And because of that, Molotov Mitchell became a follower of Christ. After he had finished his testimony, I was able to ask a few questions. 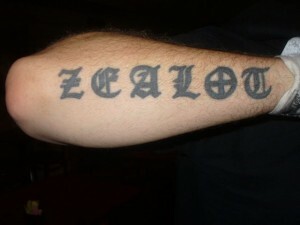 First, I asked him why he believes that Christians should be fighters, not peacemakers. He said that he lives his life so that whether he’s in a threatening situation, the political arena or a job site, people would always be glad that a Christian was present. Also, fighting gives him a chance to keep down the number of successful bad guys. For instance, crooks have tried to rob him three different times. They’re oh-for-three. He once came across two illegals beating up a police officer. They would have killed him, but because Molotov was there, and had a gun with him, the lawman got free and arrested the two men. That’s why he believes that violence isn’t bad. Next, I wanted to know whether or not he thinks he made a good choice by not going to a college. He said that without a doubt it was a good decision on his part. He has a successful business, and he was able to use the time that he would have taken up in school to learn how to do what he loves best; making movies. Next, I asked him why he began Illuminati Pictures. He said that God had told him to, and after looking around the world, he realized that the best way to impact it would be through media. Another thing I asked Molotov was how he discovers material to use in his videos. He replied that he thinks of his viewers, and of what they would like to hear about. He tries to make it funny, be insightful, and hit a point that Jesus would hit. The last thing that I asked him was why he picked the name ‘Molotov’. He smiled and said that it was actually given to him when he was younger. Because he was a scrapper and a bruiser, his friends would call him a fireball and a Molotov Cocktail. But the words that they meant for insults actually were turned around for the good, and that’s how he inherited his name. When our hour had passed (rather quickly, too) we walked back to the Krav Maga studio so that Molotov could teach his class. He had to go through an absolute torture chamber to earn his instructor’s license, which he says is pretty comparable to what Navy Seals must go through. But he and DJ Dolce both received their license, and he’s putting it to good use. His group is comprised of level ones, but they’re pretty good. He led them through a warmup, starting with their arms and ending with their whole body. Then, they worked on punching techniques. How to keep the hands at the face at all times for protection unless punching, how to throw your entire body into the strike, and what correct foot placement looks like. Just stuff like that. Then, they paired up and worked on putting the punches into practice. One person would hold the pad; the other would deliver the blows. Some people got it right away, others took a bit. But after a little bit, the sound of the wallops filled the building. The last thing that they did that night was to learn what a person should do when put in a basic from-the-side headlock. First, Molotov asked how many people had ever been placed in that situation on the playground or somewhere like that. About two-thirds of the students raised their hands. Then, he proceeded to demonstrate how to avoid that position. Here’s what I observed from watching: The number one threat of a headlock is that of the assailant taking you to the ground or choking you (assume the person is attacking from the left). To prevent both of those things from happening, you turn your head into the person and move your right foot in front of their body. That gives you a good base. Then, you simultaneously bring your left hand up over the top of their head, and your right hand down, stabbing into their groin. That should immobilize them, but in case it doesn’t, take your left hand (which should be on their head) and find their septum. Then tilt their head back, push down on the septum, and basically bench-press them into the ground, levering yourself up in the process. Sounds painful, right? Let me give you a hint; that’s the point. They practiced the move probably a hundred times each, and I just have one thing to say after watching them: I pity the fool. When training was over, I was able to talk with some of them, and find out a little bit more about Krav. When that was over with, Molotov, DJ and I all walked back to the restaurant so we could hook up with Dad. Before we parted ways, though, I asked him the rest of my questions. Is this a job that he’s wanted to do his entire life? Not at all. He got into media because it can change the world, and because he’s a creative person. Next, I asked him what he wants his impression on people to be. He said that wherever he goes, and this applies to everything, he wants people to say, “Man I’m glad a Christian was here!” Lastly, I asked him if Illuminati Pictures goes beyond For The Record and News, News. He said yes; they’ve made music videos, documentaries, commercials for politicians, and even a few movies. They’re actually coming out with a movie soon called Gates of Hell, and he highly recommends it. All I can say is that I’m glad there was a paper bag handy, because I was gasping like a cigarette addict (joke). Fortunately, I was able to fall asleep moderately quickly, and the next morning came in a flash. I awoke at eight, and Dad and I checked out of our hotel, eating in between. When we got to our destination a bit after ten, Molotov instantly led us into one of the facilities where they record the movies. They had a green screen, a few bright lights, and a camera; it looked like something that you’d see in Hollywood, just a little smaller. Molotov introduced me to his cameraman, Mikey, who hooked me up to a microphone so we would be ready to go. I did everything impromptu, with no script, I guess so it would flow better. I was a little nervous, but after messing up take #37 (joke) I finally started to get the hang of it. Molotov would give me a few key words to say, and I would just build on that. We spent about half an hour just trying to get a couple of minute’s worth of footage, but it was a whole lot of fun. Finally when they decided that everything was perfect and the way it should be, I once again said farewell. My first two days in Raleigh were some of the best of my life. Great people, great scenery, and great food made my trip one of the best 52 godly men experiences of the year. 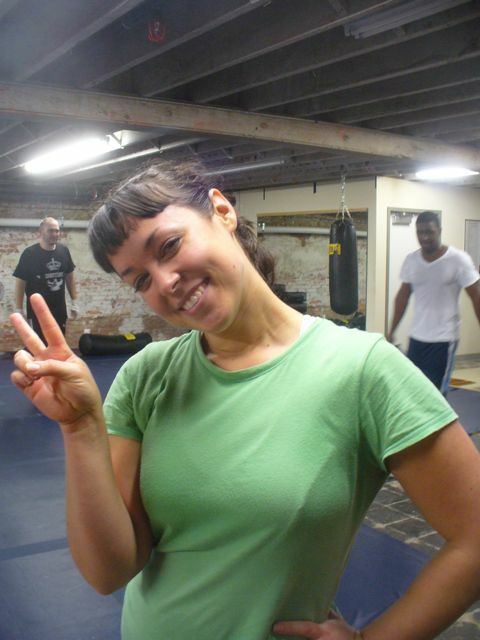 I learned a lot about making movies, Krav Maga, and life in general. I also made a great friend. But most of all, I took away from the trip a knowledge that anyone, doing anything, can change the world. Boy, you talk about inspiration! So whenever anyone tells you that what you’re doing isn’t important, who knows? Maybe one day you’ll be in a position that you might have thought of as just a fun thing to do, changing the world yourself. 8 Responses to "Week 39: Fighting For What’s Right"
Awesome story David! Very inspirational. You’re very fortunate to have a father willing to give you such a wonderful gift! Wow, David, this is REALLY well written! I am very impressed. I saw Molotov’s link to your blog and really enjoyed your narrative. I think this journey your dad is taking you on is incredible. 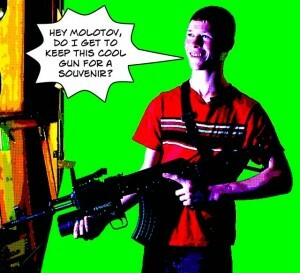 I knew Molotov when he was in middle school, although I haven’t seen him in many years. He’s always been a very lively and energetic character. You will look back with great memories and look forward with great inspiration from what you and your father are doing. I’m jealous! What a GREAT blog! You have a future in journalism my friend! Keep writing solo de gloria!!! Awesome!! Congrats on your website! Tell your family I said hi. Wonderful. Sadly that is the only word that I can use to describe your adventures. I am happy in my heart to see such a thing happening in our country and I wish that this was something that more people could do, young and old. Like a concert without the music just knowledge being passed to others. I have been down for a bit now because of our country’s direction, but you have given a little hope that it might be ok. Thanks! Great job writing this article! I really enjoyed reading it! It’s hard to imagine that it was written by a 13 year old. In addition to writing experience, you have sure gotten a lot of valuable life experience this year through 52 Godly men. Kudos to your Dad Craig for giving you such a great and inspirational gift. David, great blog, and what a great gift from your dad! My sons and I have put some videos up on YouTube of our adventures, some with firearms. We desire to have a Christian presence, a quieter one on “drzmanproject”, and a more open one on “drzee00”. If you have a YouTube channel, let me know and I’ll friend/subscribe!